Once again on November 11 a memorial meeting will be held to commemorate the death of the Chicago Haymarket martyrs-1937 is the fiftieth anniversary and this meeting bids fair to be more widely observed than any of the forty-nine previous ones. It has taken fifty years to dig the facts of this case out from under the mountains of lies that was heaped upon our martyrs by the exploiters in their attempt to cover up their crime of sending five labor leaders to the gallows. You will hear people say today, as one said to me recently, "What! Calling those Haymarket bomb throwers martyrs? Do you think I believe that? You will have to show me." Now I am writing this article to "show" all such doubting Thomases. The Haymarket meeting was held as a protest against the brutality of the police who, during the great strike for the eight-hour work day of 188.6, tried with all the vicious power at their command to defeat the hopes of the workers. At noon on May 3, 1886, the striking workers of the McCormick reaper works were discussing their problems in a, mass meeting near the plant when two patrol wagons loaded with policemen appeared. With drawn clubs the police rushed down upon the workers, clubbing them. Two workers were shot. The next evening the famous Haymarket meet-ing was held to protest against this and other outrages of the police. This meeting was attended by about 3;000 people, men and women. I myself was there with our two children. The meeting was perfectly peaceful but when it was about to adjourn a company of police charged upon it and ordered the crowd to disperse. At the onrush of these police, violators of the law they were sworn to uphold, someone—to this day he. is unknown—hurled a . bomb into the ranks of the police. Then hell broke loose! The papers came out next morning with great flare headlines, "The anarchist dynamiters,, bomb-throwers had started a riot and had intended to blow up the city; and but for the courage of the police they would have thrown many more bombs," and so on. They demanded that the leaders be arrested and made examples of. 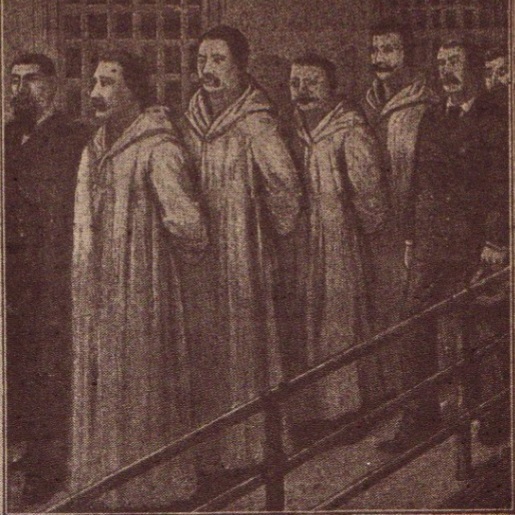 Six weeks later eight men (our Chicago martyrs) were arraigned in a prejudiced court before a prejudiced judge and a packed jury. They were charged with murder. "I went to the meeting for the purpose of dis-persing it should it require my attention, when the meeting was about to adjourn I went to the station (about half a block away) and told Captain Bonfield to send his reserves home, that the meeting was about to adjourn, that the speeches were tame." "These defendents are, not more guilty than the thousands who follow them; they were selected by the grand jury because they were leaders. Convict them and save our society." "I am managing this case. Those fellows will hang as sure as death. I am selecting men that will compel the defense to waste their challenges, then they will have to take such men as the prosecution wants." The trial, so-called, lasted sixty-three days. The jury brought in a verdict of guilty in three hours. "The twelve good men and true have rendered a just verdict, let them be generously remembered. Raise a sum of '$100,000 to be paid with the thanks of a grateful public." When the march to the gallows was begun all the men showed remarkable courage without the slightest tinge of bravado. Parsons was wonderfully composed. The moment his feet touched the gal-lows he seemed to lose his identity . . . "No tragedian ever made a more marvelous presentation of a self-chosen part," a capitalist paper reported. On that gloomy morning of November 11, 1887, I took our two little children to the jail to bid my beloved husband farewell. I found the jail roped off with heavy cables. Policemen with pistols walked in the inclosure. Then I said, "Let these children bid their father goodby, let them receive his blessing. They can do no harm." In a few minutes a patrol wagon drove up and we were locked up in a police station while the hellish deed was done. Oh, Misery, I have drunk thy cup of sorrow to its dregs but I am still a rebel.